Christmas is around the corner, just in two weeks or so. It’s a time of getting together with family and friends, having more good foods with lots of laughter. Christmas is also a time for giving and receiving tangible presents that convey love. While you can read this post, you’re one of the lucky ones in the world, at least you have the internet access. I’m so thankful that I’m one with you as well. Upon reading Penny’s post on “Bake A Difference this Christmas”, it got me thinking of doing something special for this Christmas. If that would bring something different for some people who don’t have their homes, or other necessities, let alone the internet access, why wait then? Baking biscuits might be a trivial thing to do on a normal weekday or weekend. But when I baked these white chocolate, macadamia biscotti as Christmas presents to bring along to share with other families tomorrow afternoon, I sensed a significant meaning behind, being part of an event held by CSR Sugar to help disadvantaged Australians. For more details about the event, please head over to Penny’s blog. Whisk butter with caster sugar and icing sugar until pale white. 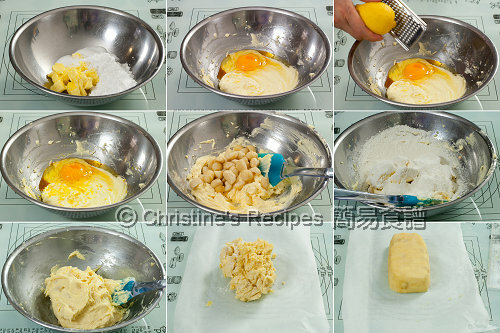 Add vanilla essence, egg and zest and combine. Add chocolate and macadamia nuts. Sift in the flour and baking powder and combine with a spatula, by adding one-third or half of the flour at a time to make it easier. Don’t over whisk the mixture, just to combine all the ingredients. (It will be slightly sticky.) Transfer to freezer for 25 to 30 minutes, until it turns hard enough to knead, but not yet frozen. Preheat oven to 160C (315F). Remove the dough from freezer and transfer onto a baking paper. Sprinkle some flour and shape into a log about 5cm wide and 15cm long. Transfer onto a baking tray. Bake for 30 to 35 minutes, or until firm to touch and just cooked through. Cool on tray. Reduce the oven to 150C (300F). Cut the log diagonally into 1cm thick slices with a sharp knife. Place on the lined baking tray in a single layer. Bake for 20 minutes, or until the biscotti are crisp. Transfer the biscotti to a wire rack to cool completely. The thinner the biscotti you cut, the shorter cooking time it takes, the crispiest biscotti you’d get. Be careful the thinner biscotti will be easier to be broken into pieces. If you’re already satisfied with the colour on the biscotti, but they are not yet crispy enough or not up to your preference. 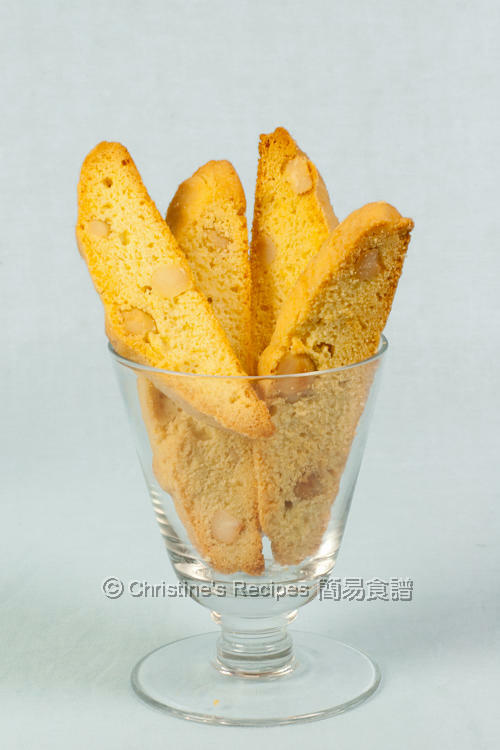 Simply turn off the oven and leave the biscotti inside the oven until they dry up completely and turn crispy. hi christine can you substitute the macadamia nut with another nut? Biscotti! I want these with coffee - black! I love biscotti esp chocolate with orange. I would be happy to receive these as my X'mas gift : ). 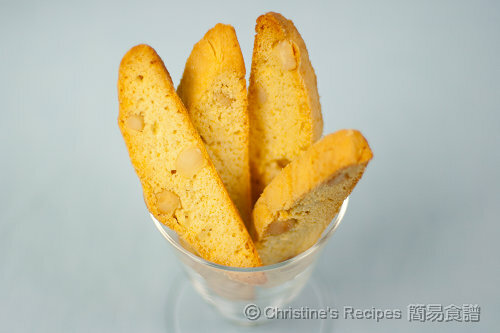 Great tips on the biscotti Christine! And congratulations on participating in such a wonderful event. Hope you are having an awesome weekend! These biscottis look lovely and I especially like the macadamia nuts in them. Very thoughtful of you. This biscotti sure looks good! This is perfect for my everyday cup of coffee. The colour of your biscotti looks stunning! Thanks for this recipe, you make it look so easy. Will try it out as biscotti is a personal fave but have never made it. Texture looks spot on.